Preserving: If only fruit trees operated like chickens do; each morning a fresh apple to eat and for almost all the year round. Unfortunately they don’t and as it gets to the end of the season we have excess, which is rotting on the ground and the last tomatoes have stubbornly refused to turn red. One of the ways of making use of the fruit, enabling us to eat it throughout the year is preserving. Our neighbour Carol (previously referred to on this blog as the “Delia Smith” of St Maden) has been giving us pots of jams and chutneys for some time and recently lent Gabrielle the book she uses, Preserving by Oded Schwartz. Unfortunately, this superb book is out of print and the second-hand ones are going for silly prices on Amazon UK but we did find a copy in the US at a sensible price on Amazon.com. Inspired by the book, she’s gone on to make peach jam, peach chutney, fig chutney, orange marmalade with coriander seed and Triple Sec, marron glacé (chestnut purée) green tomato chutney and lastly, pink grapefruit marmalade. She’s also promised to try onion marmalade, which apparently doesn’t taste of onion! The peach jam didn’t work for a couple of reasons: she didn’t use a heavy-bottomed preserving pan, and hadn’t added additional pectin (peach is low in pectin, apparently). More by luck than design, we found we already had a preserving pan, which came in a set of saucepans we bought to kit out our holiday gite . 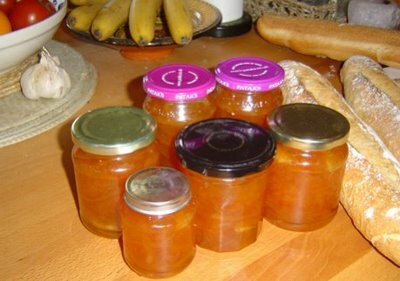 With marmalade, for example, the first stage is a long, slow cook to get all the fruit to soften and then, once the sugar is added, it’s a hard, fast boil to reach the setting point. One determines the setting point by talking a teaspoonful of the mixture and putting it on a very cold saucer and, as it cools, you push it around to see if a skin forms and goes wrinkly. Pectin can most easily be added by adding a chopped up cooking apple, core, pips and all, wrapped up in a muslin bag, and left in the mixture during the first stage of cooking, then squeezed thoroughly before removing. You can also buy special preserving sugar, which comes with added pectin. Boiling the peach jam in the vain hope of it setting, in the wrong saucepan, lead to a smell of burning and the whole lot going to the chickens. Gabrielle’s top tip is that you must stay next to the pan and concentrate during the second, hard boiling stage. If you come and stay in our holiday cottage you will have the opportunity of doing a half day preserve making course with the expert herself, Carol.